NYC Public School Parents: Join us on Thursday to protest the waiver! Yesterday, Commissioner Steiner approved a waiver for Cathie Black, a magazine executive, to become our next Chancellor, despite a total lack of educational qualifications. For more on the approval, including the fact that the mayor has consistently overstepped the law when it comes to our schools, see today’s Times. What can we do? Join the new Deny Waiver Facebook page, and keep up with the latest news and developments. 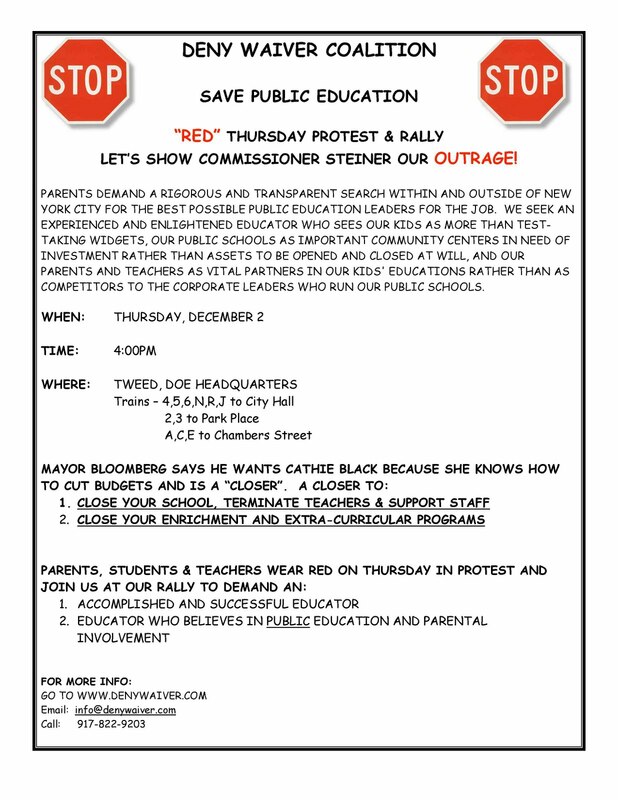 Join with parents across the city in the Deny Waiver Coalition on the steps of Tweed this Thursday, December 2, at 4 PM, and wear red to show your outrage. Here's a flyer. Post this event on your Facebook page and invite your friends and colleagues. We’ve had eight long years with our schools run by a non-educator. Class sizes have risen sharply, our children have lost art, music and science, test prep has replaced learning, and the results? Black and Hispanic students have fallen even further behind their peers in other large cities, and we are the only city in the country where non-poor students actually score worse on the national tests than in 2003. It’s time to start fighting back. Join on Thursday, and spread the word! Above is a flyer you can post and hand out at your schools.